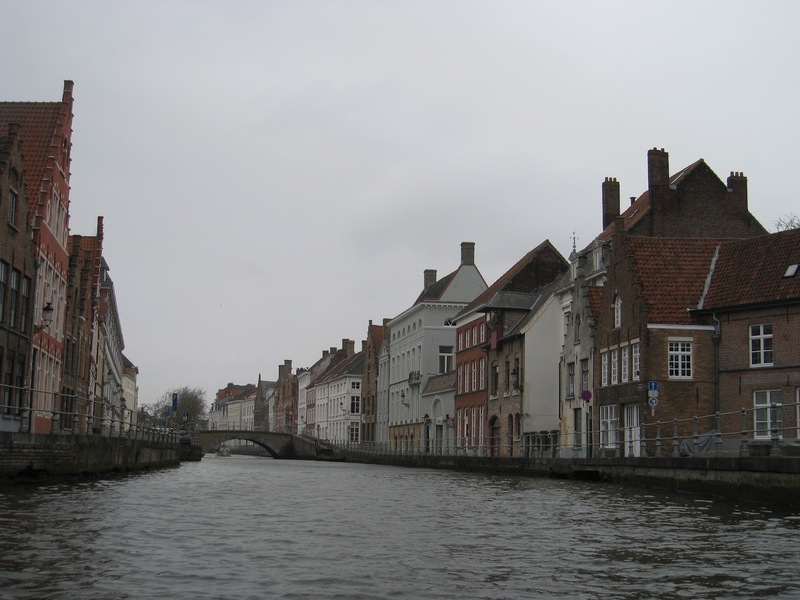 Travel Diaries: Bruges ~ Diane's Vintage Zest! On the way to Bruges we had a transfer in Antwerp, which had a beautiful train station. Too bad I can't capture how beautiful it was but I suppose if you want to see it, you'll have to see it for yourself! 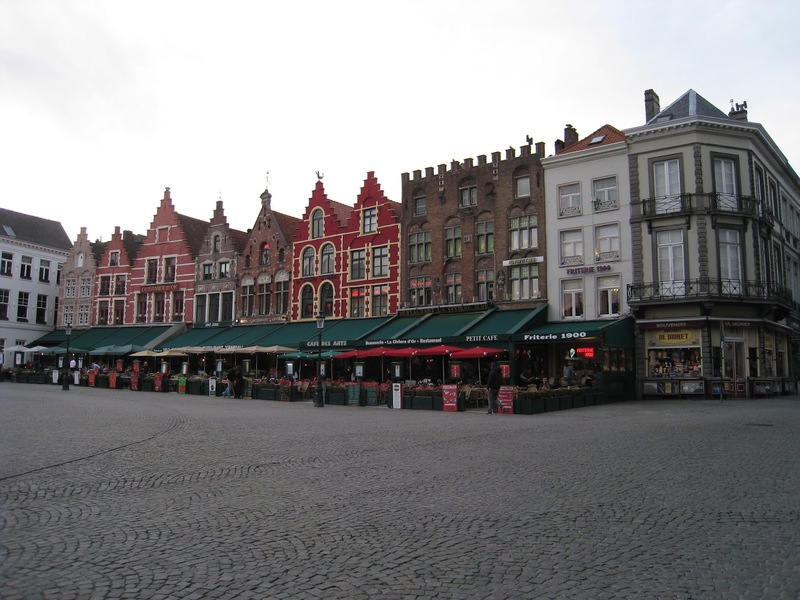 When we arrived at Bruges, the train station was seriously packed and getting a bus into the center of town was a bit crazy. Then when we arrived, we weren't sure where to pick up the key from our host, so it took about another hour to get settled. Finally, we got a chance to see some of the town as we walked around. 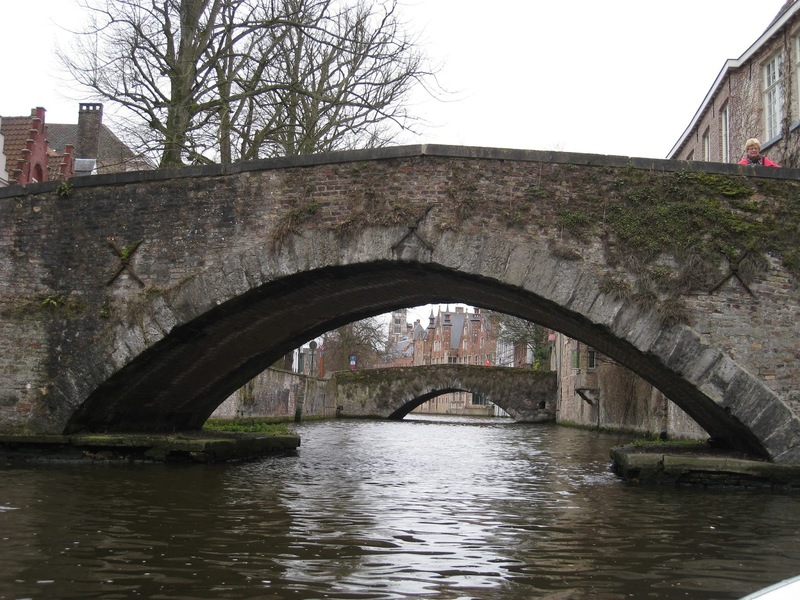 There were tons of beautiful canals and bridges like Amsterdam. 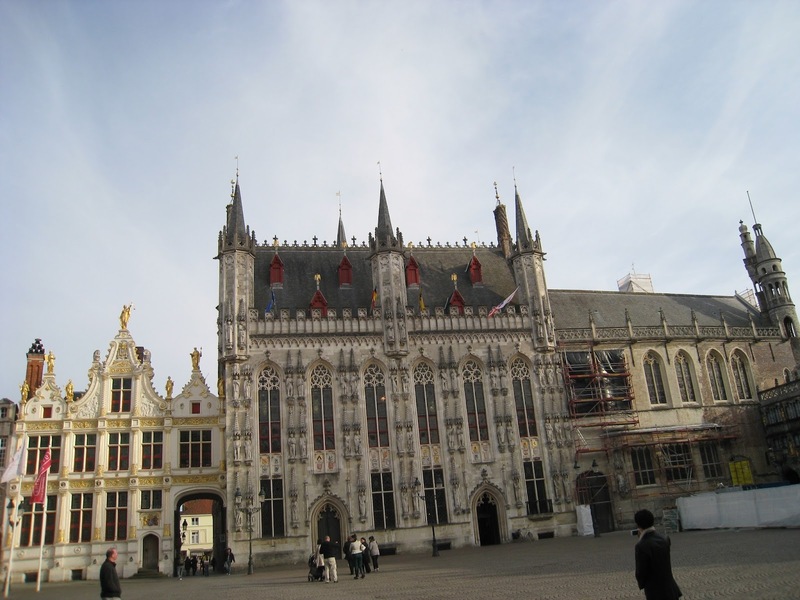 Even better than Amsterdam was the Burg square, with the City Hall and Basilica of the Holy Blood one side, which were really beautiful and impressive. 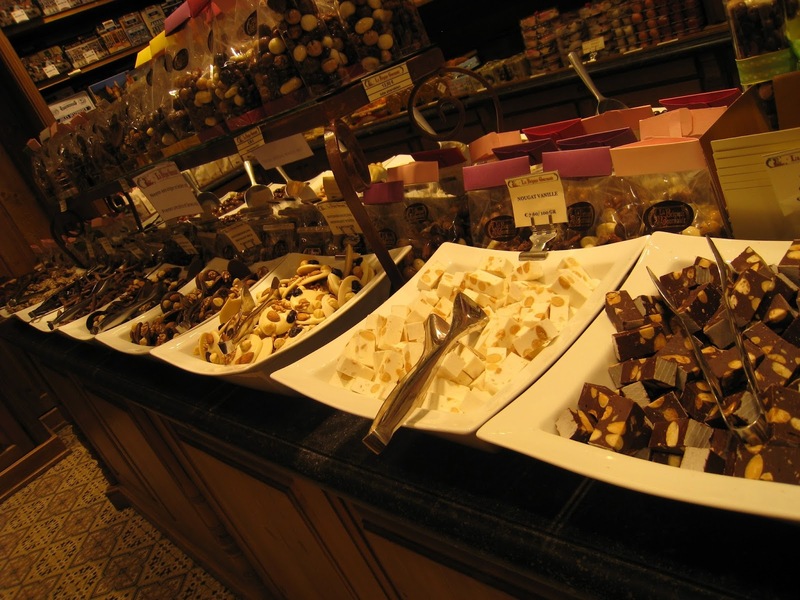 To get to the Markt Square, we walked down Breydelstraat and found a couple of sweet shops that were too tempting to pass up! 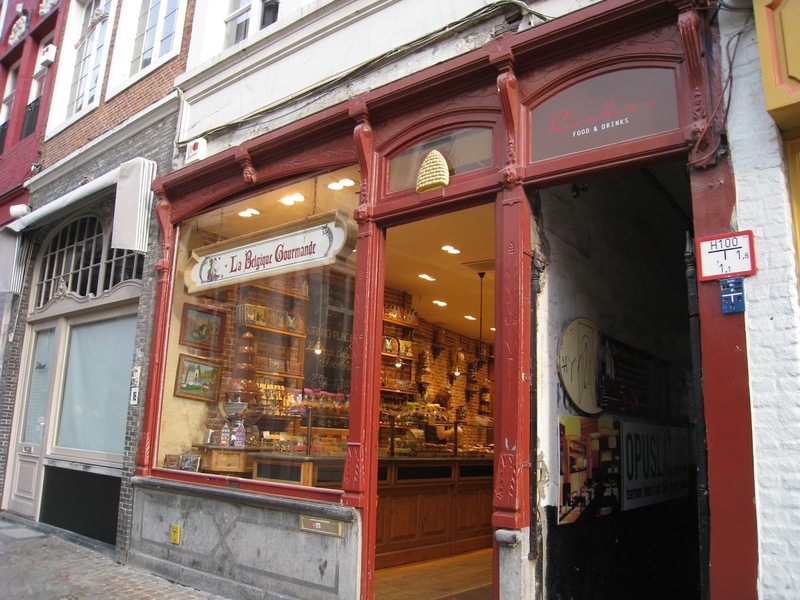 First we stopped in La Belgique Gourmand. 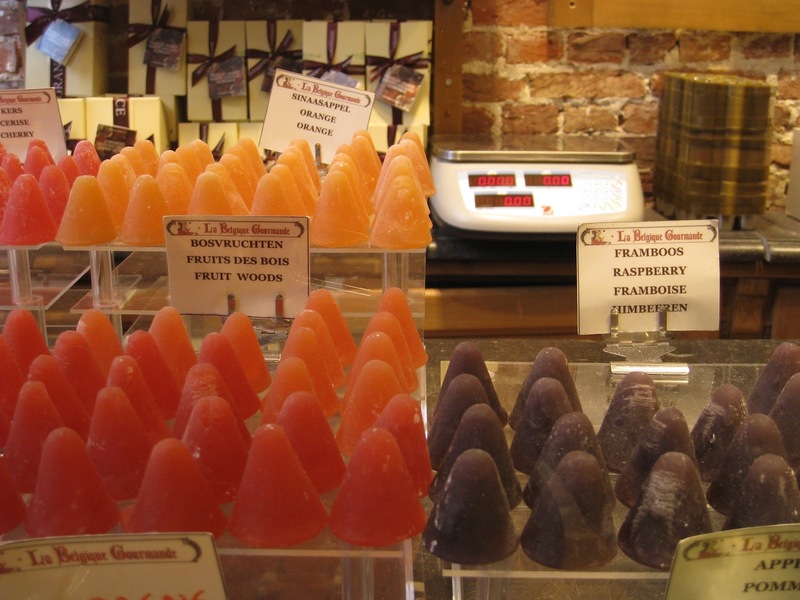 We tried seven different flavorsof gelatins, of which raspberry was my favorite. Super sweet and gooey in the center, they could definitely give you a sugar rush! 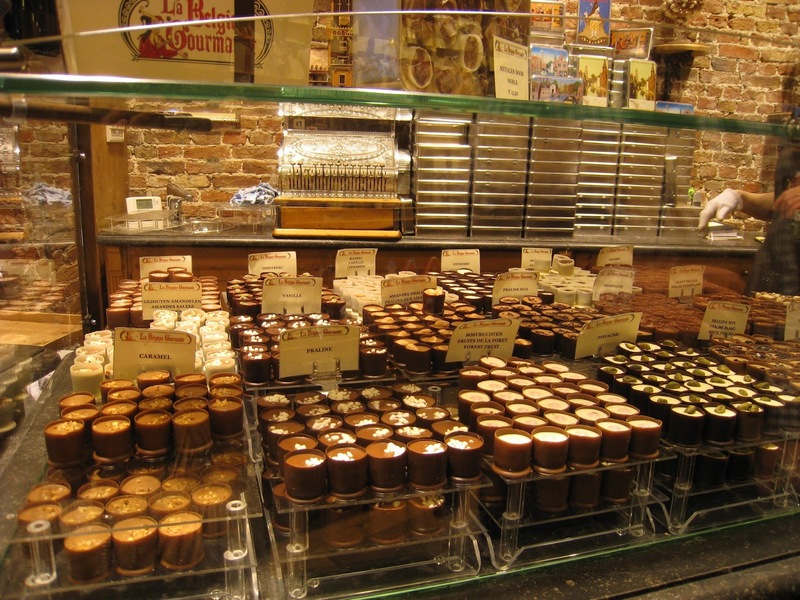 We also picked out seven different flavors of these, which were all ridiculously delicious from pistachio to praline. And the rest of the store still awaited us! 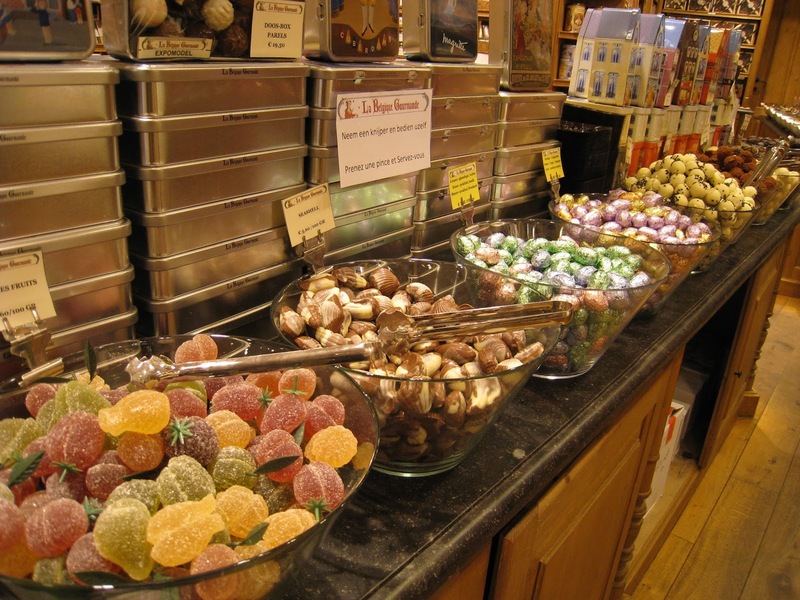 All of the sweets and chocolates were tempting, but we couldn't possibly buy any more sweets! 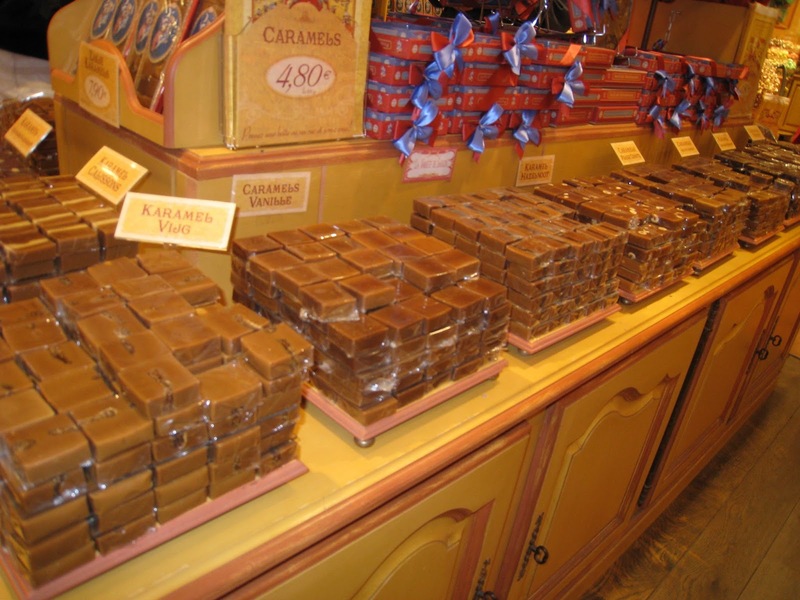 Even the nougat was available in a wide variety of different flavors! I'm actually not as much of a chocolate fiend as my guy is, but even I had a hard time turning down these chocolate dipped confections! 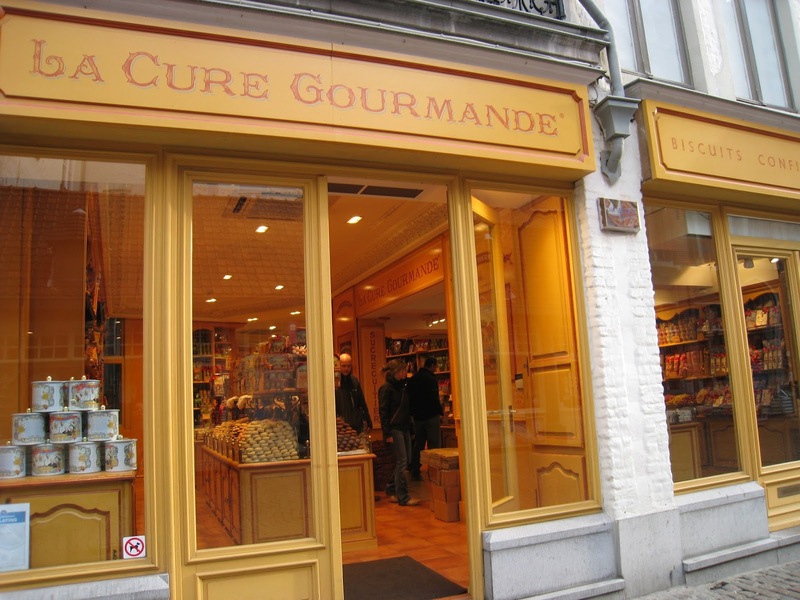 Later on, I found out that this is actually a chain with another branch in Brussels, but this store had lower prices and more charm in my opinion. Take a look at the register area. Sooo cute! 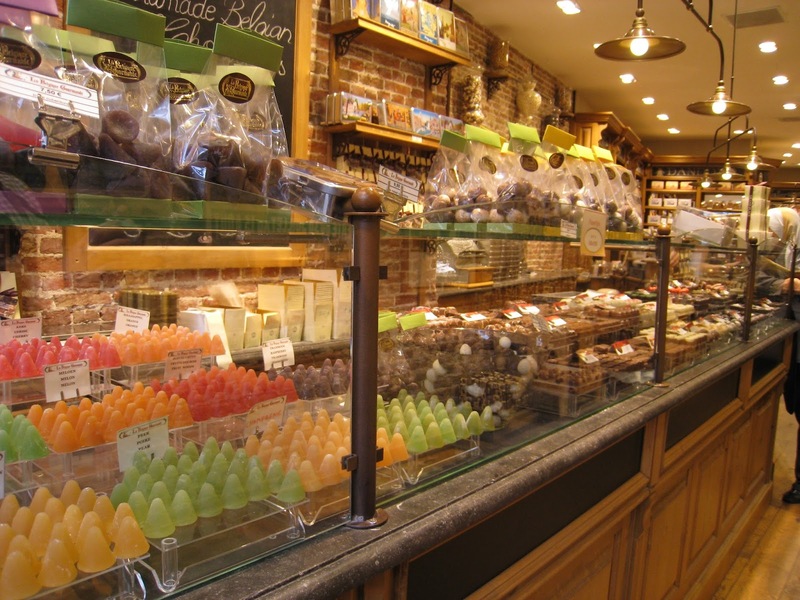 Right next door, I was swayed to enter La Cure Gourmande just by the beautiful cookie display that I spied through the open door. 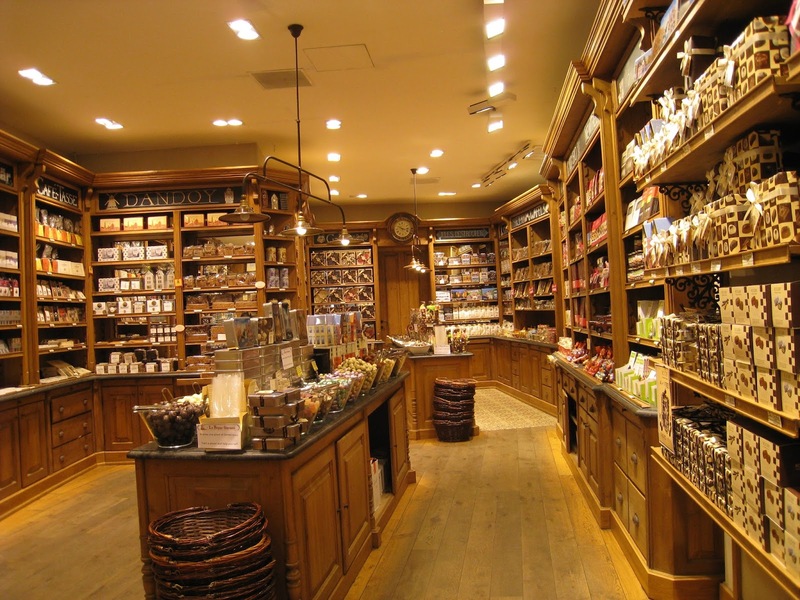 The store also smelled heavenly, like butter and sugar baking. Yum! 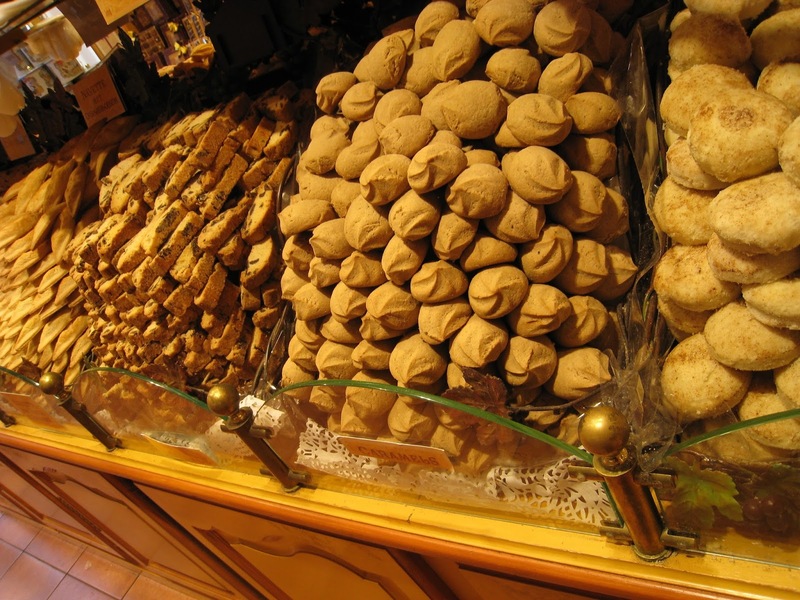 We selected three cookies: a cinnamon and orange tea cookie, a vanilla butter cookie, and a chocolate filled. 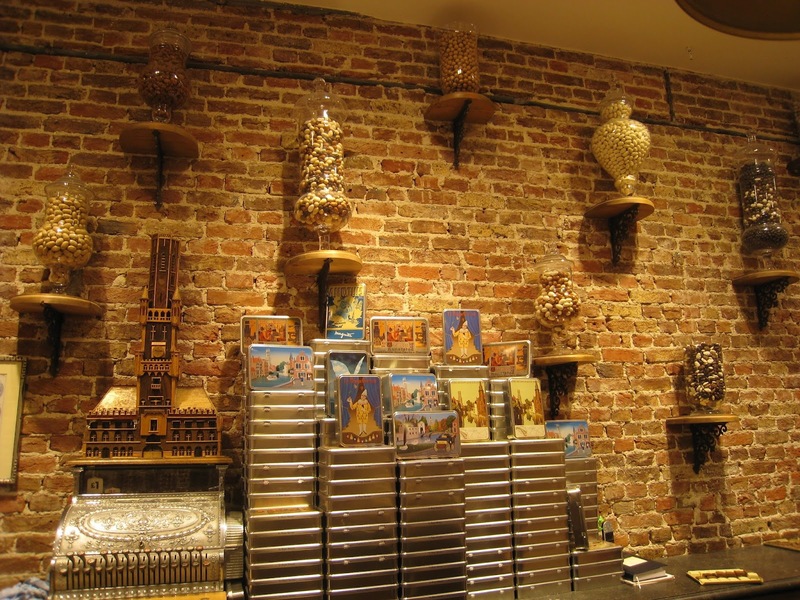 In another part of the store, they had a selection of caramels that I couldn't resist buying for souvenirs. One vanilla and one sea salt, thankyouverymuch! 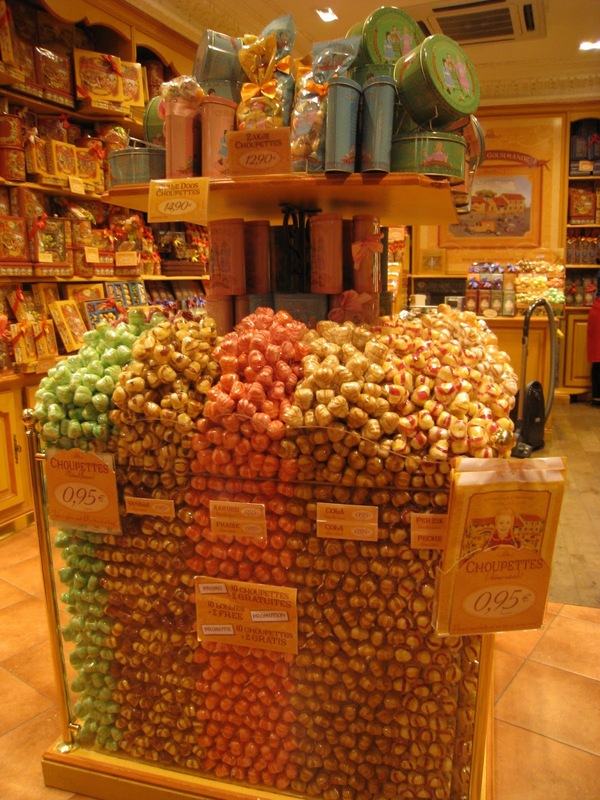 I adored this lollipop display as well. 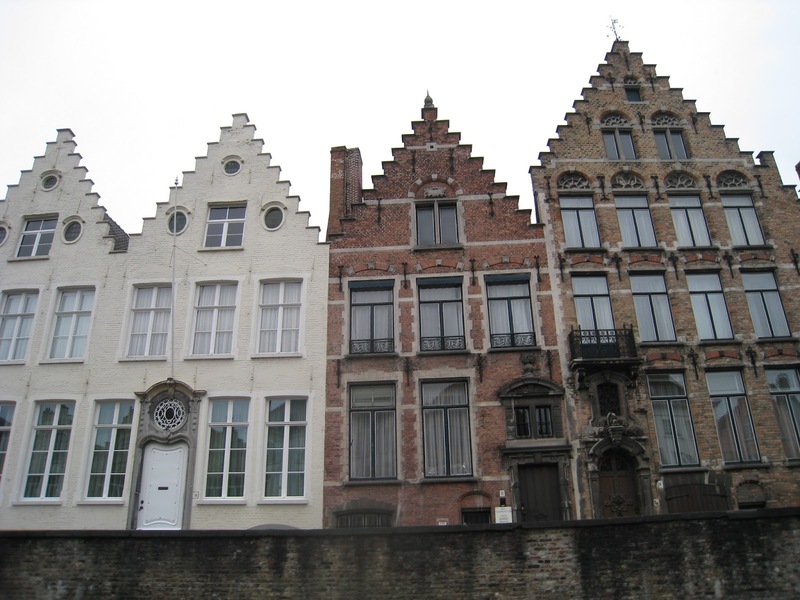 ...and a whole host of cute buildings with unique architecture. Of course, they were all restaurants on the bottom, so it makes for a lively atmosphere during the day. 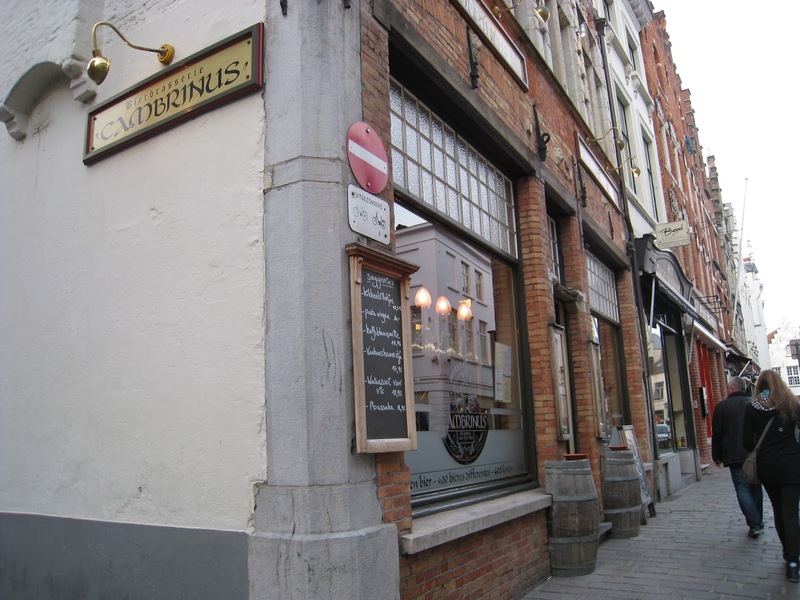 At the suggestion of our host, we stopped at Cambrinus to see if they could take us for dinner. My guy had a flight of beer, and easily completed his mission for the day to try at least three new beers for every day that we were in Belgium. 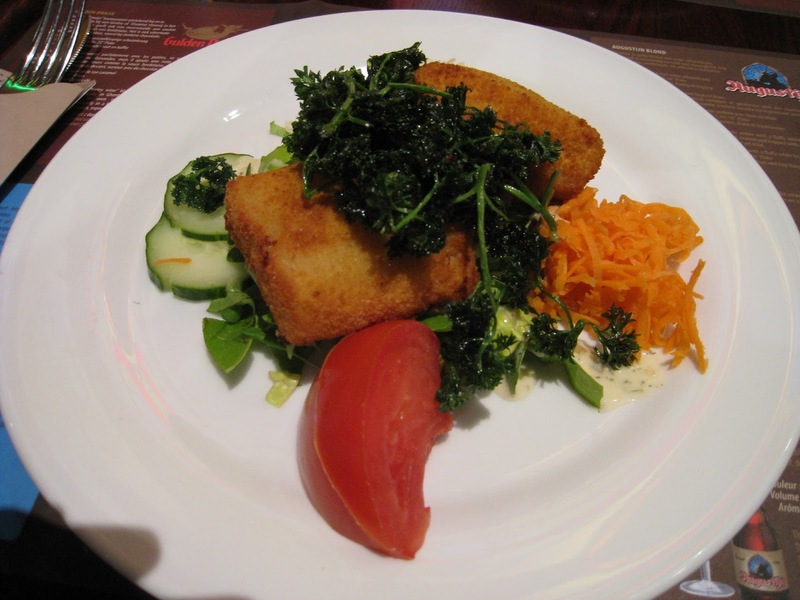 He started with an appetizer of cheese croquettes. 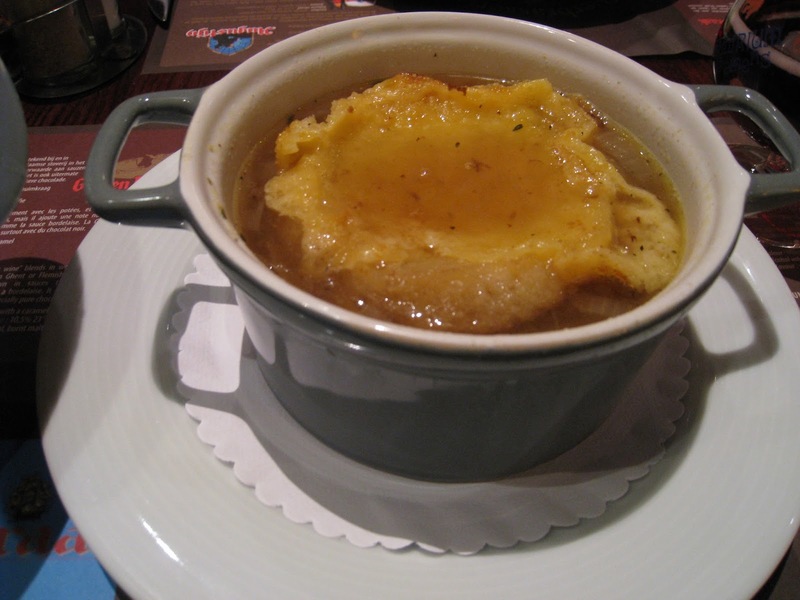 ... French onion soup! To our surprise, it was probably the best onion soup we've ever had! Sometimes, it can be too meaty, rich, or salty tasting, but I suspect that they used either a lighter homemade chicken or vegetable stock, which made it so delicious! It was no surprise, however, that I had the better dish. 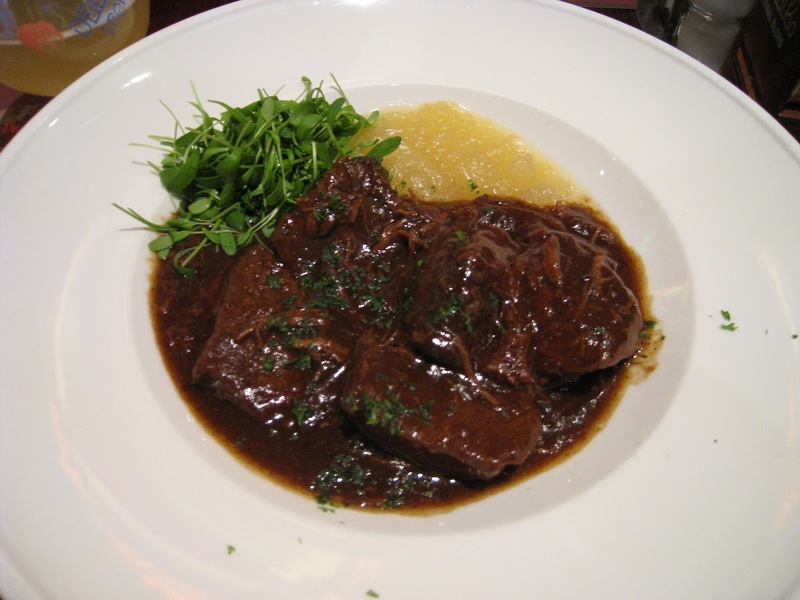 He ordered a traditional beef stew, which was almost like a short rib in texture. Highly recommended for sure! 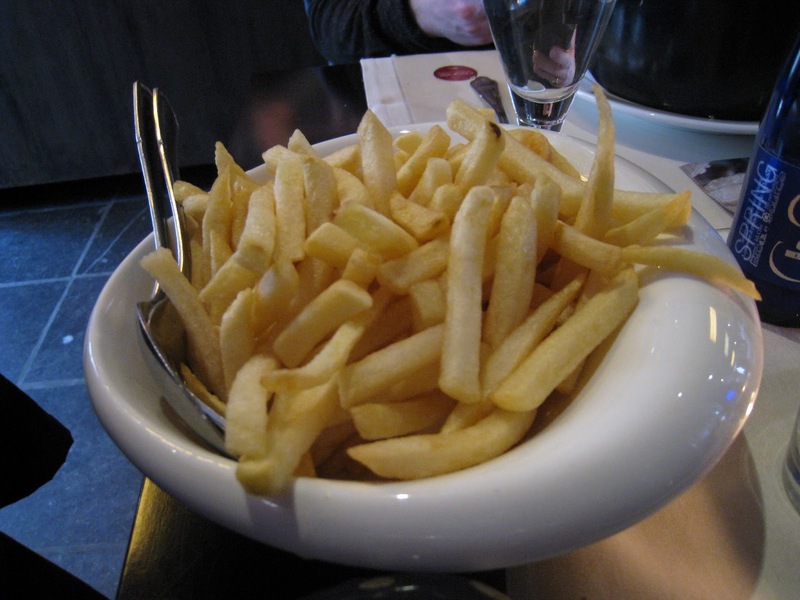 It of course, came with fries. I have to mention that they unseasoned and a bit mushy, and we ended up having a ton left over. My guy didn't think we should bring them home, but they ended up being a good breakfast on the go while we were rushing around! 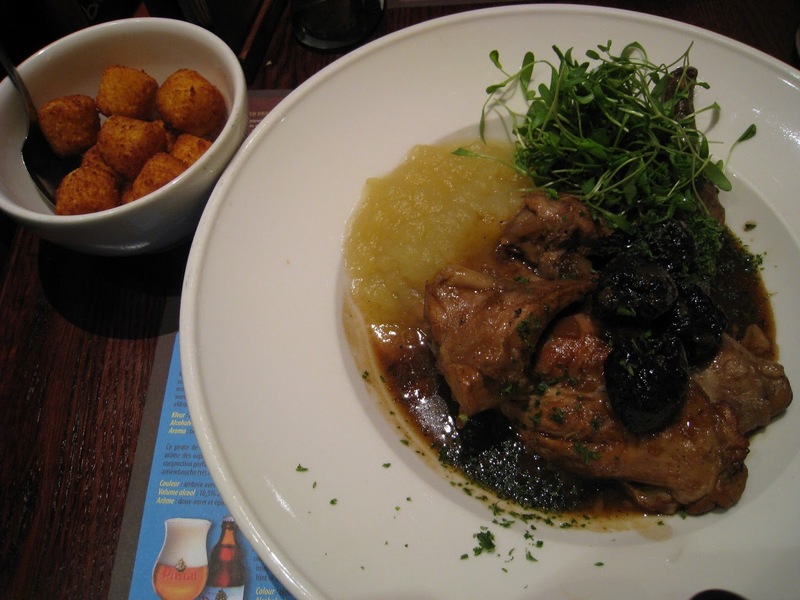 I had a rabbit with prune stew, served with applesauce and what looked and tasted like tater tots. 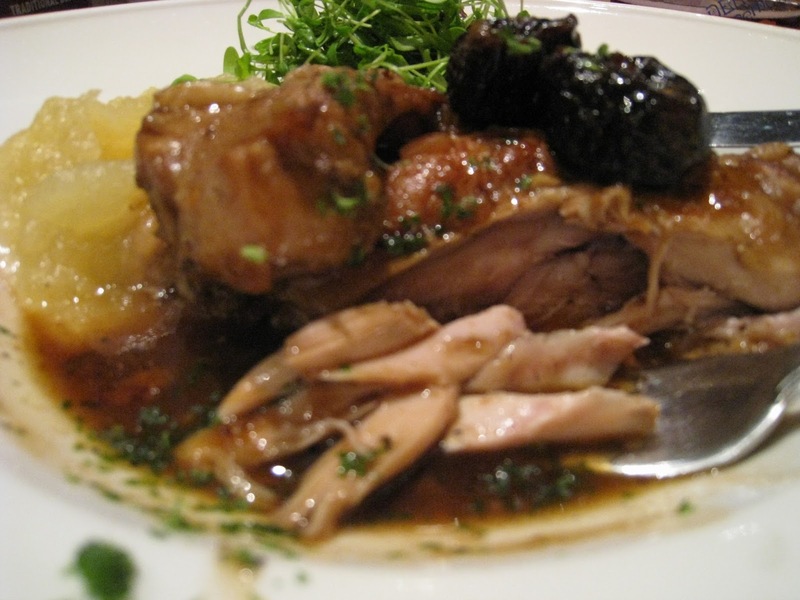 Easily the most well cooked rabbit of my life! It was so tender, I had to do a quick check that I hadn't received chicken instead! Not gamey or tough, like rabbit can be at times. 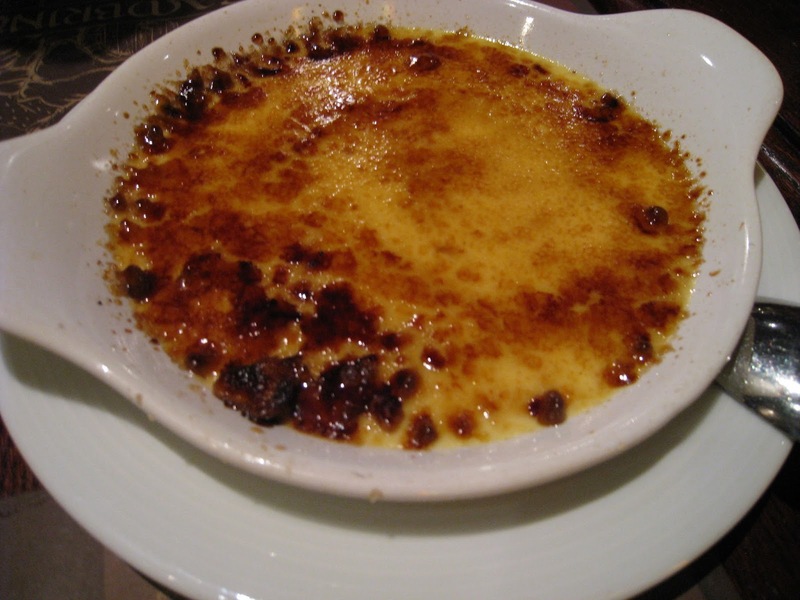 For dessert, we shared a giant creme brûlée, which was definitely a sweet ending to a great meal! 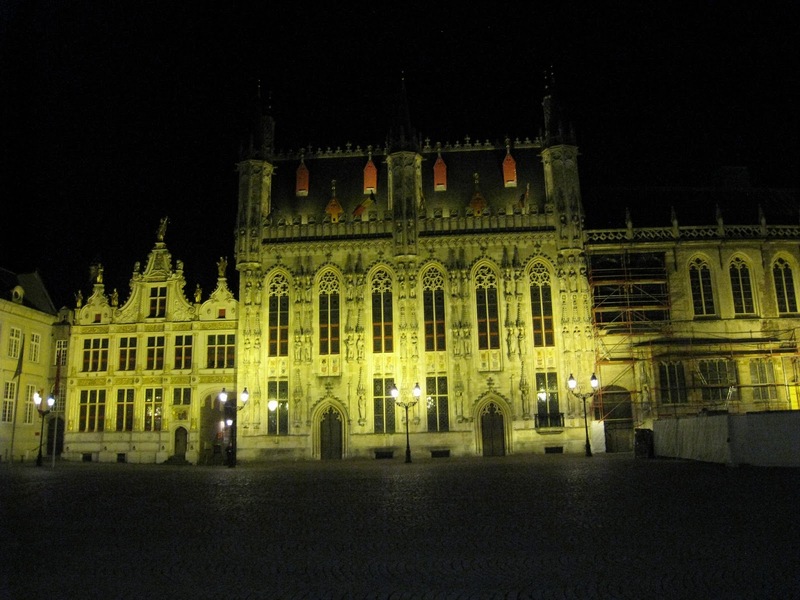 On our way back home, we strolled back through town to catch some of the beautiful architecture lit up at night. 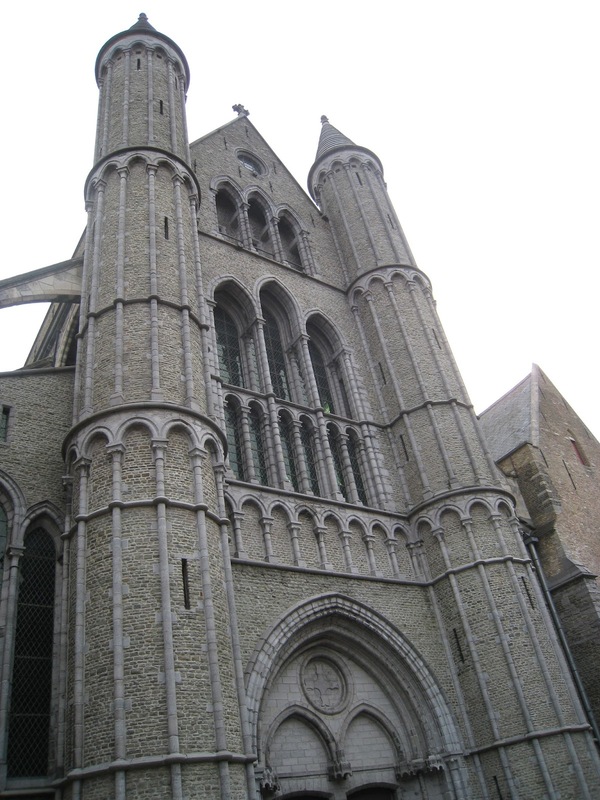 First thing in the morning, we headed towards the Belfort tower to climb to the top! 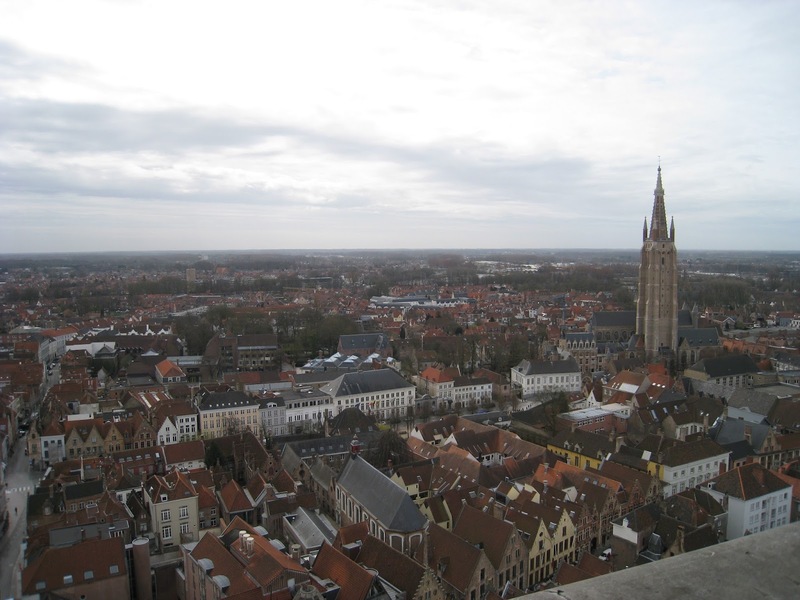 Any time you climb a tower in Europe, beware the amount of steps and the steepness and width of them too. I have tiny feet, and I could barely fit onto the steps sideways near the middle of the spiral! It isn't a problem until you pass someone going in the other direction, and then you just hold your breath and squeeze by! The views are always great, and on this side we could see the tower to the right. 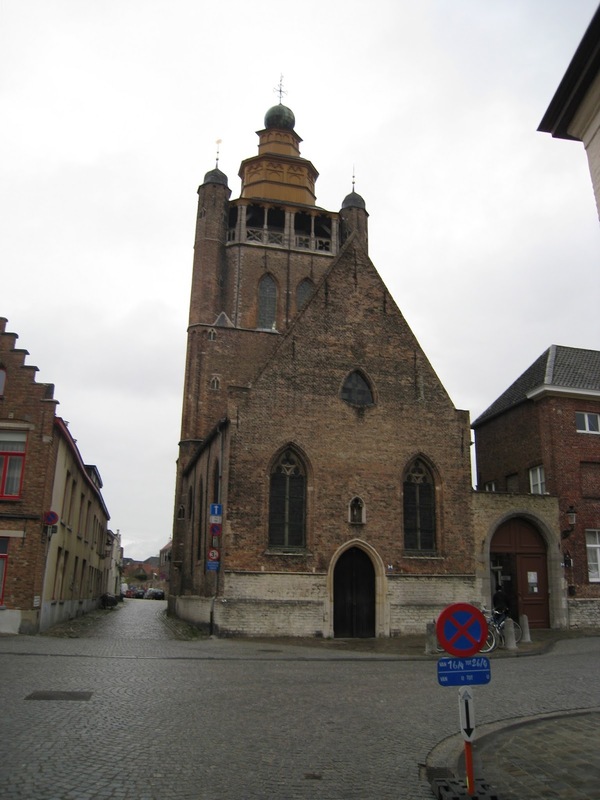 Also, the machinery of the bells started to clang while we were up there, and we had a mini concert at the top! 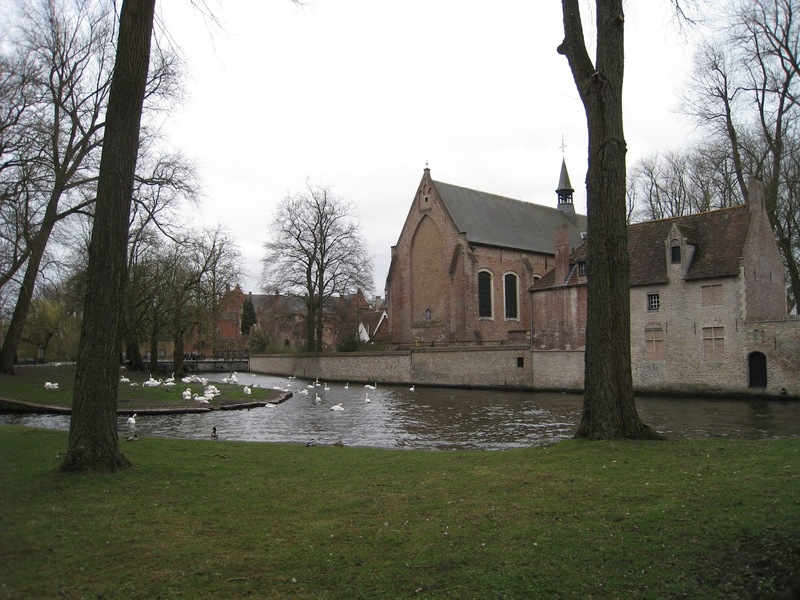 While waiting for the next tour, we stopped by Begijnhof and the nearby Lover's Lake. It was so, so pretty with all of the swans. Then of course, we got to a highlight for my man, a brewery tour! That's number 2 on the trip for everyone keeping score. The machinery and everything was old school, and there were great views from the top of the building as well. 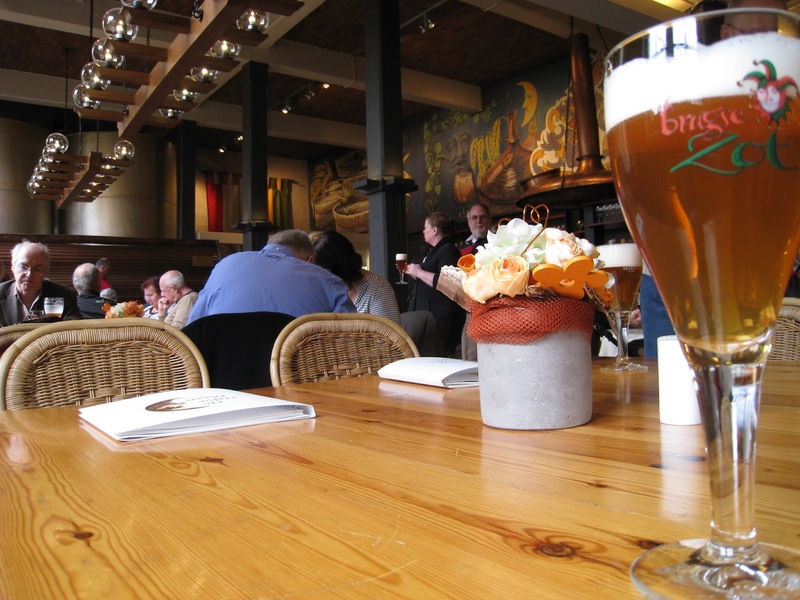 Afterwards, we had a beer in the restaurant, where they used to dry the grains in the old days. 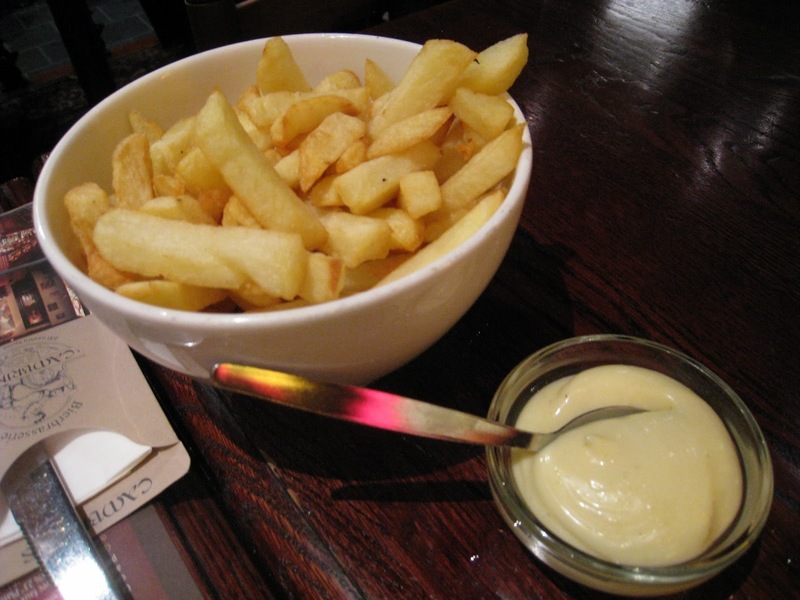 Outside, we walked to find a lunch spot to have our first mussels & fries. 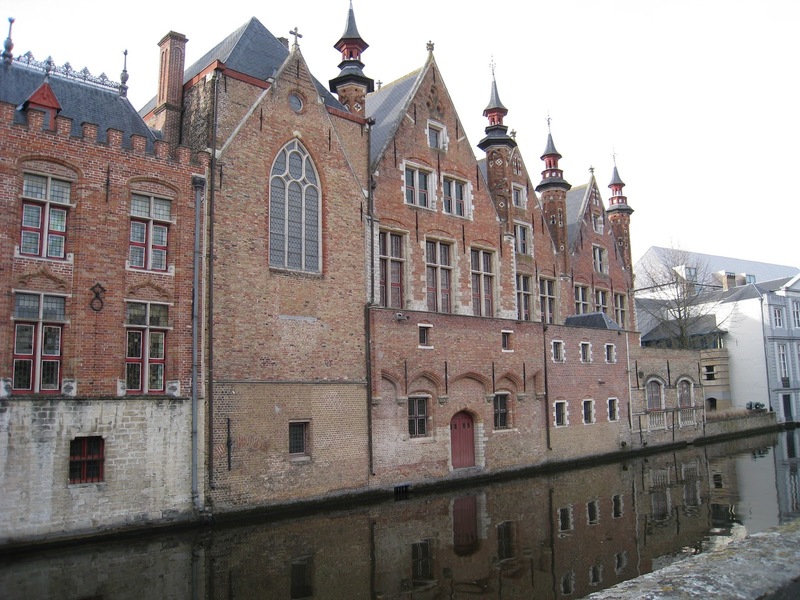 But of course, we encountered all kinds of gorgeous buildings and canals along the way. It was raining on and off, so we popped into the next shop to dry off for a bit while getting our bearings. 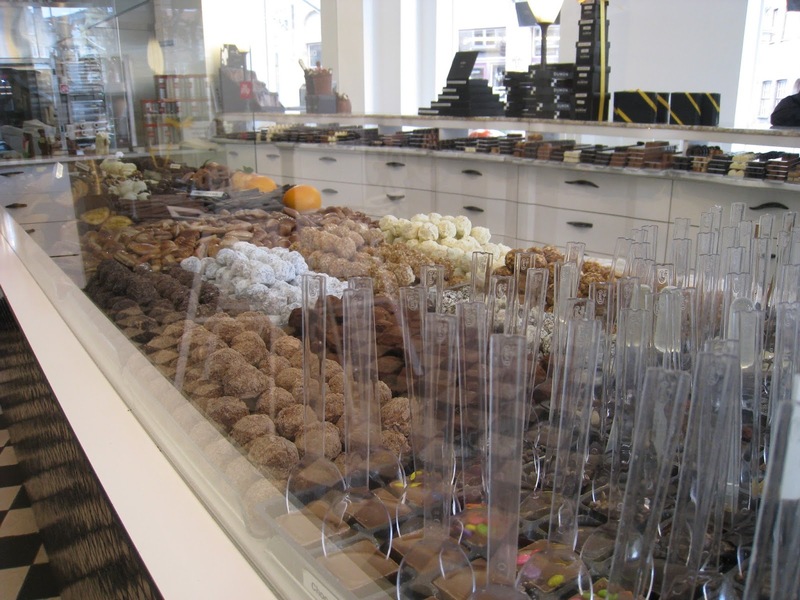 Surprise, surprise, it was a chocolate shop! 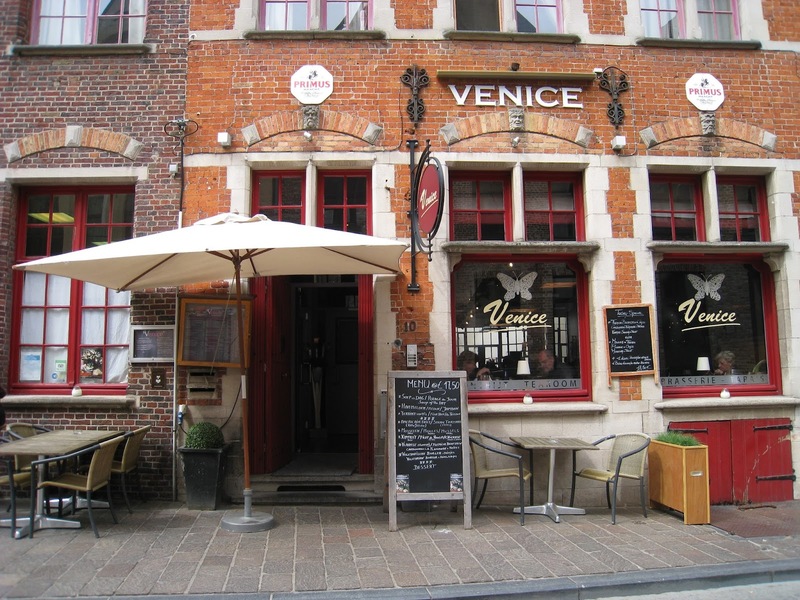 The closest lunch spot we could find on the way to our next destination was Venice. We each got the same tasting menu, because it seemed simple and traditional. 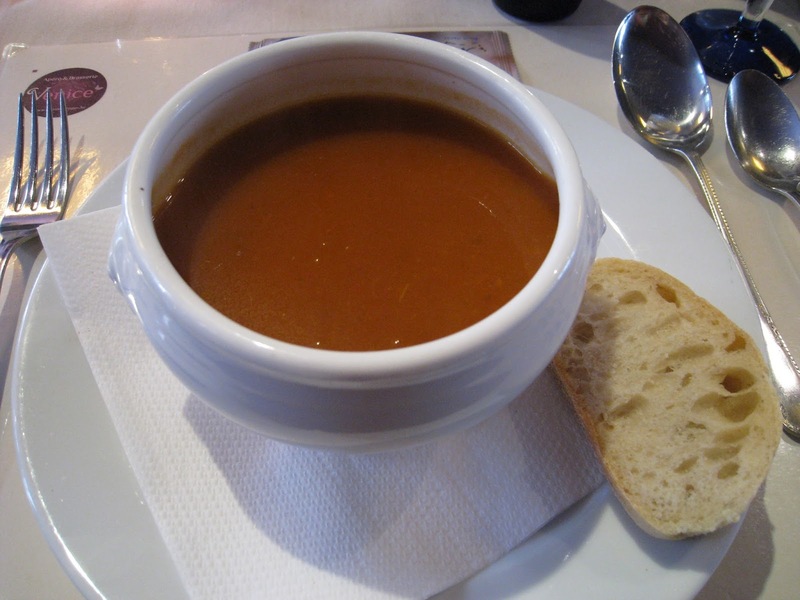 First, we started with tomato soup. 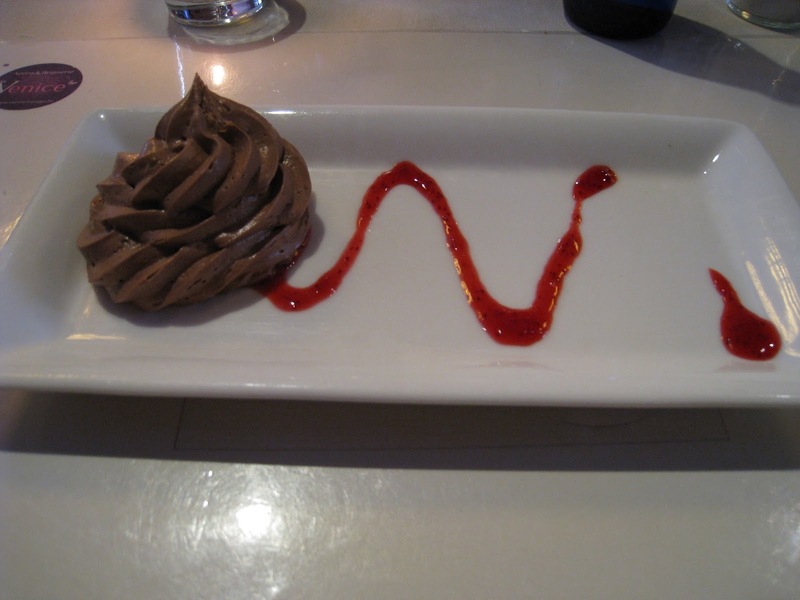 And a chocolate mousse dessert. All were good but not outstanding. You could probably do better or worse looking on your own. 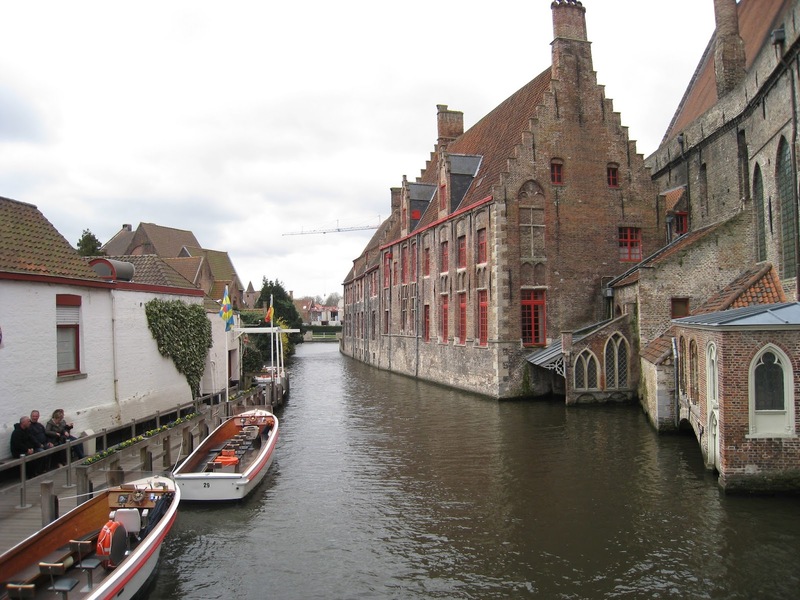 And then something we were both looking forward to was the canal tour! Even more beautiful architecture to admire. It was fun ducking underneath all of the bridges while passing underneath. 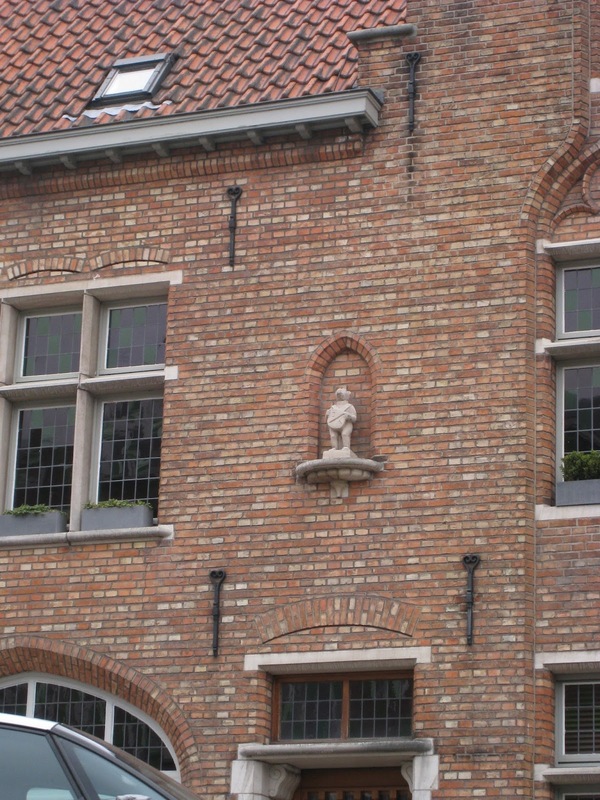 The tour guide even pointed out the Bruges "mascot!" 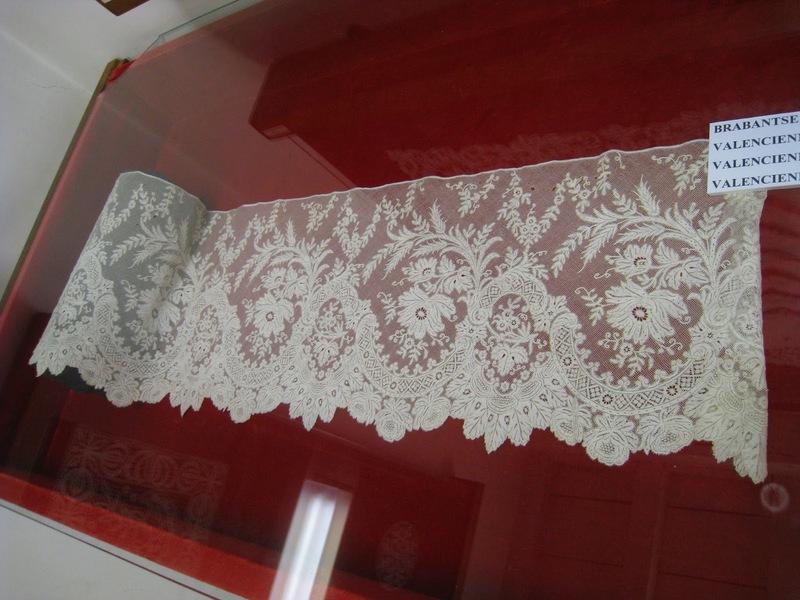 Our last stop was the Kantcentrum where the famous lace is made! 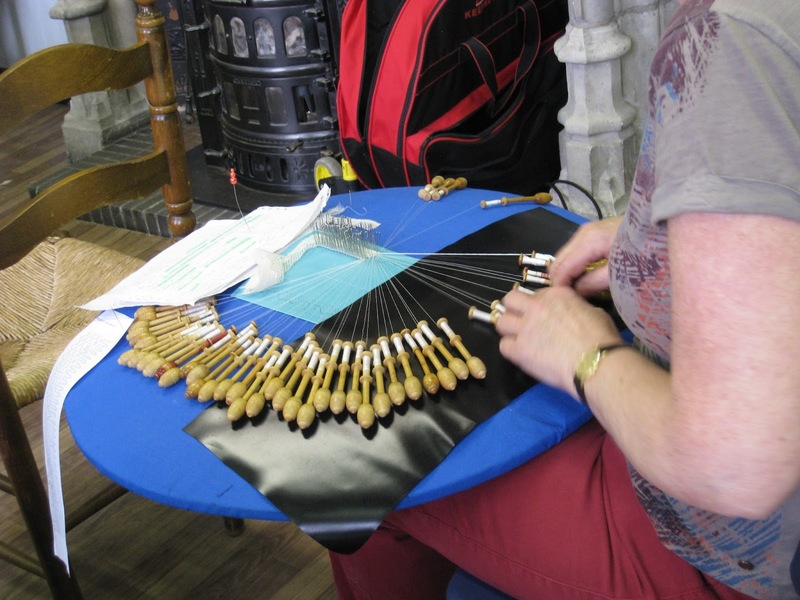 With a pattern, pins, and a spools of thread, they quickly create some amazing designs! Here is one super intricate piece of edging on display. Simply gorgeous! 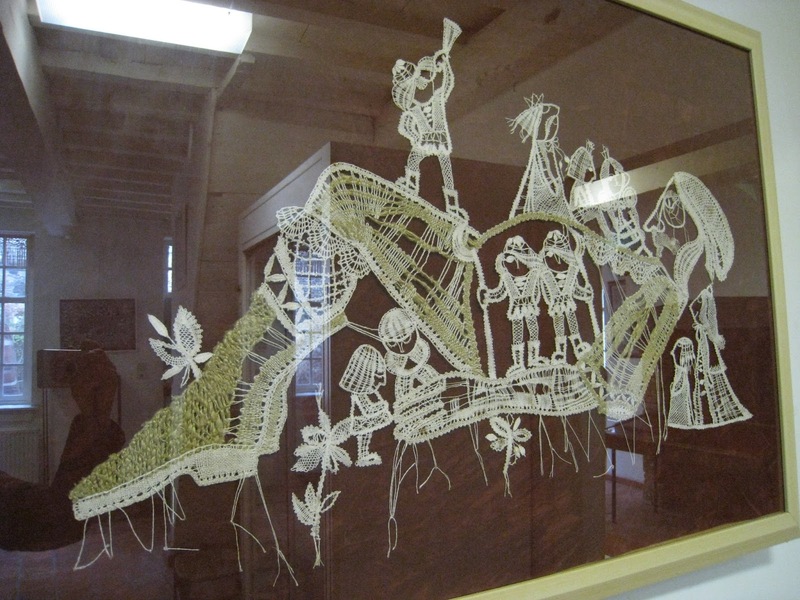 And one more unique bit of lace art. It's too bad that we couldn't stay longer and soak in the atmosphere, but we had to get to Brussels!!! that's not the train station of rotterdam ! 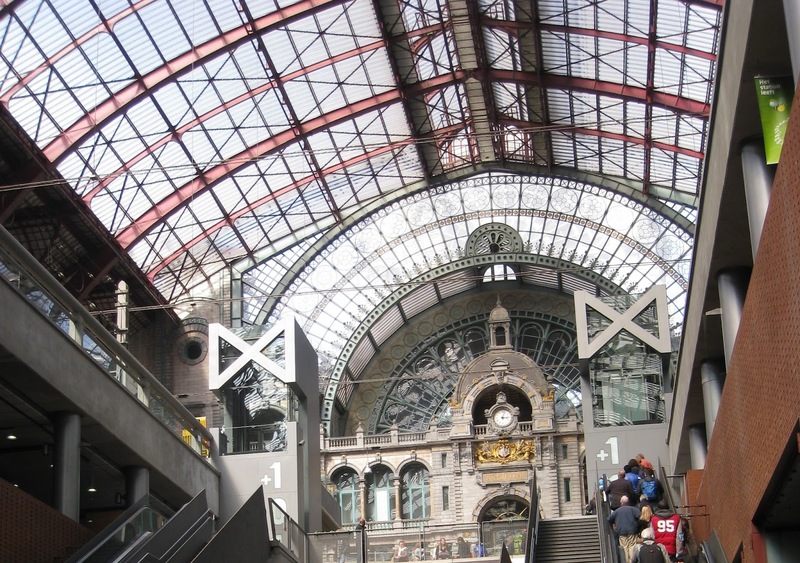 It's the beautifull station of Antwerp ! 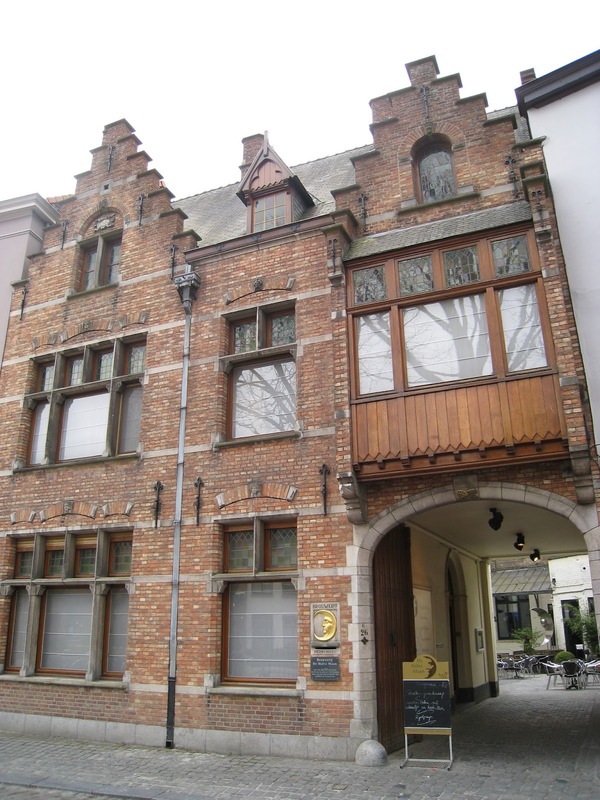 Rotterdam is in the netherlands, Antwerp and bruges in Belgium ! Wonderful pictures! 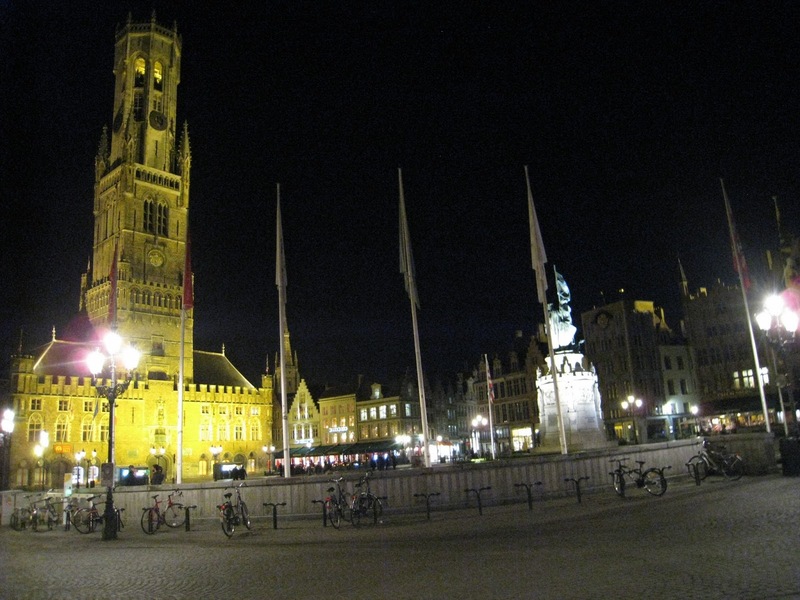 We drove from Paris to Munich over the summer and almost stopped in Bruges, but thought it better as a longer stay. 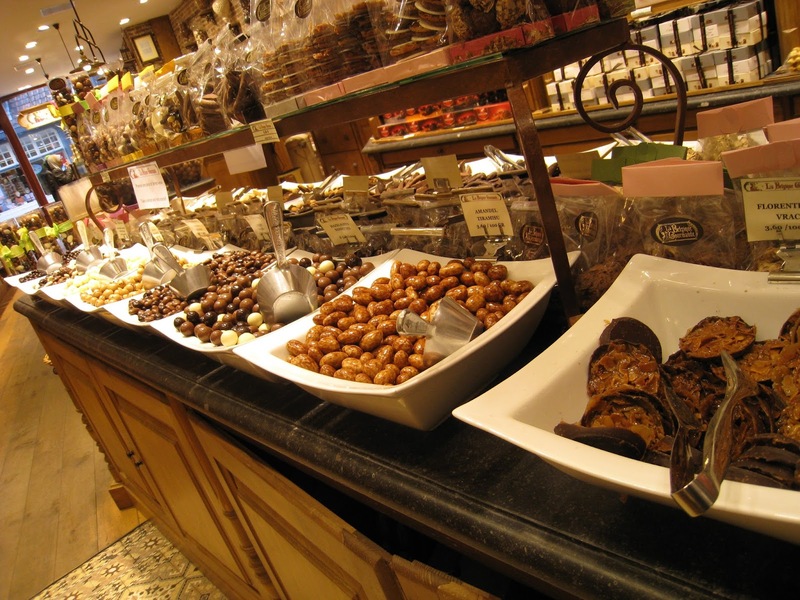 The sweets, chocolates, and mussels look delish! Looks like a great trip! It sounds like an amazing trip. Thanks for sharing the pictures and your adventure with us. Lovely images...looks like a wonderful trip with wonderful sights and tastes and artisan crafts. Thanks for sharing it with us. Hi Diane: What an amazing trip you had--Brussels looks wonderful, and I'd love the visit these beautiful towns myself someday! Thank you for sharing all your great pictures. 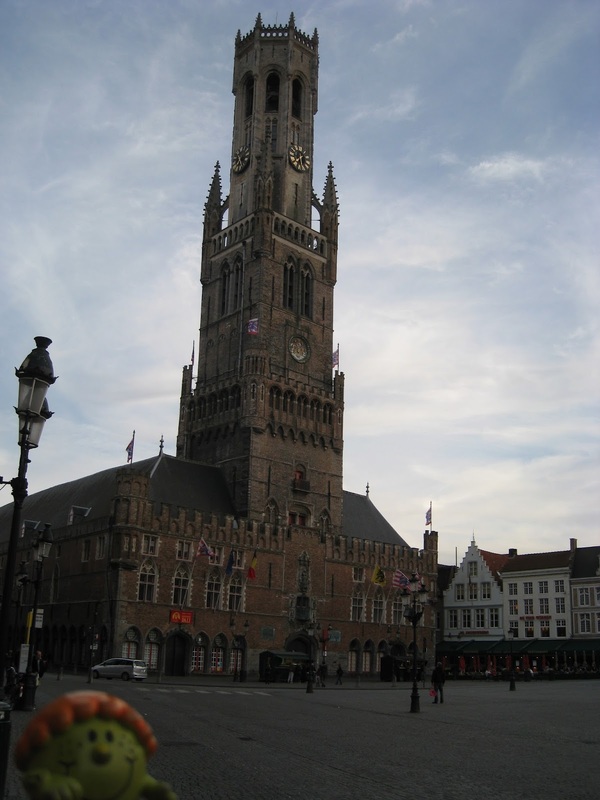 I spent a month in Brussels a few years ago and we did a day trip to Bruges. It was a Saturday and PACKED with people shopping so that it was hard to get down some of the streets! 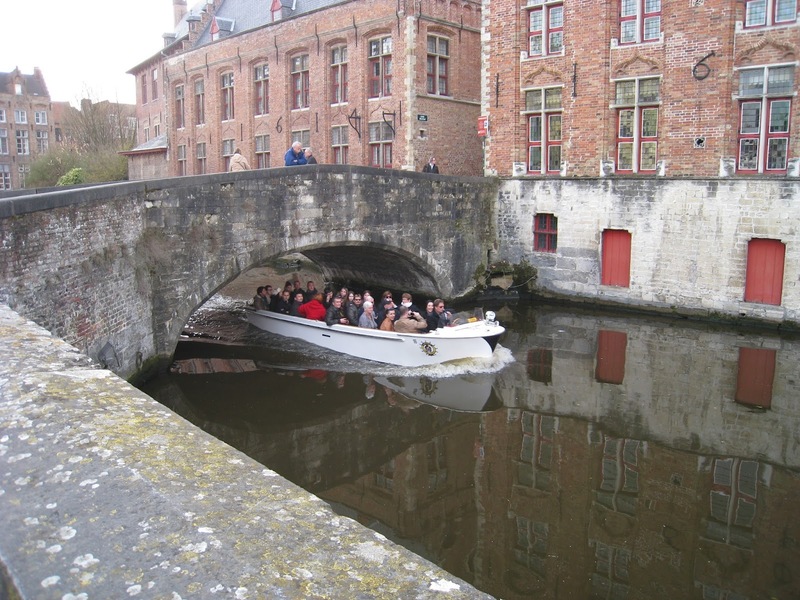 It was a cute place and I loved the canal tour with the swans. You don't mention the swans so I wonder if they are still there. 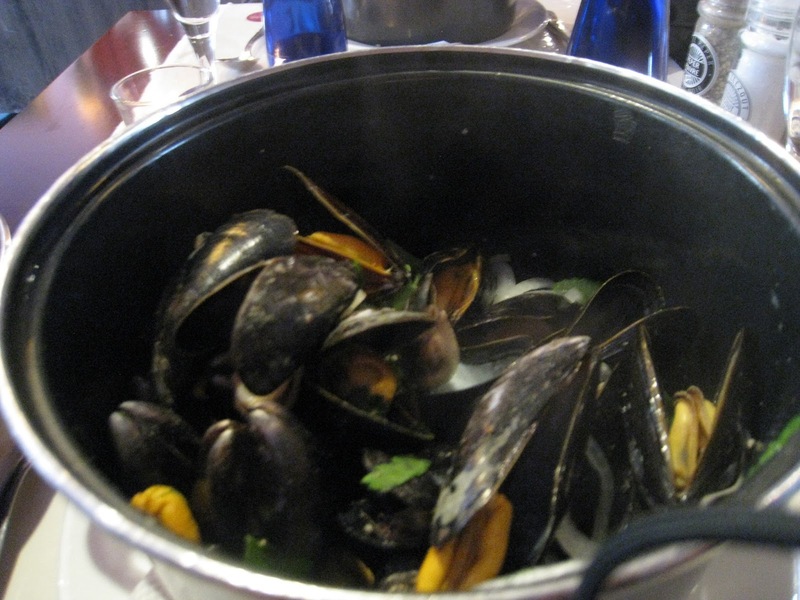 I laugh when I look at your pot of soup because only in Belgium have I seen pots brought to the table for soups, stews and of course, moules. 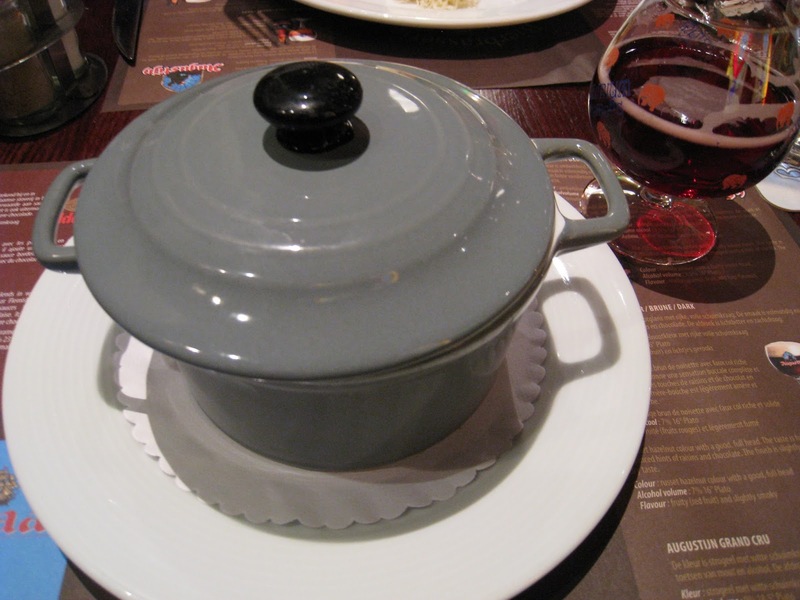 We'd never accept a pot at the table in the US! The swans are still there! There were just so many pictures to choose from. :) Since we were there for the off-season, it was not super-packed but it was one of the busier places we visited over our trip actually!